Clean up in our latest competition! If there’s one thing that makes cleaning a LOT easier to deal with, it’s having the right equipment for the job and, thanks to our lovely friends at SEBO, our competition winner this week will have just that. 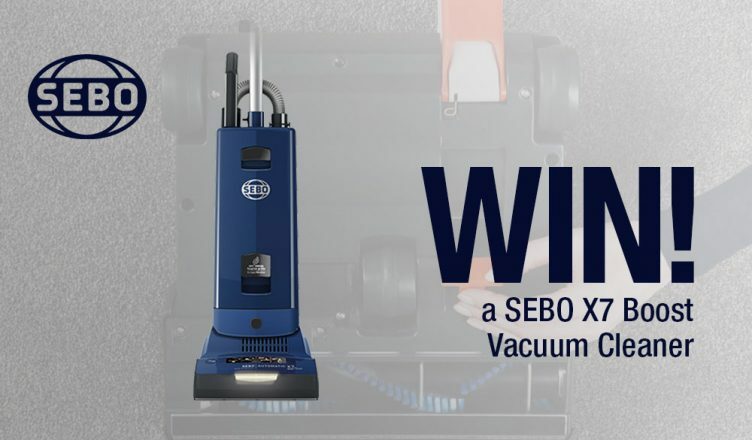 This week our competition will see one lucky winner win a Sebo X7 ePower vacuum cleaner. Made in Germany, SEBO vacuum cleaners are constructed from the highest quality materials. Every SEBO vacuum cleaner undergoes a full testing before it leaves Sebo, so you can be sure that when you buy (or win) a SEBO vacuum cleaner, you are buying the best and the SEBO X7 Boost ePower certainly doesn’t disappoint. Read on to find out more about this vacuum machine’s features and spec, and discover how you could WIN one, in our free to enter competition. The SEBO X7 ePower is an upright vacuum cleaner that hosts the latest suction technologies. Fitted with the S-Class-Filtration system, the SEBO X7 is approved by the British Allergy Foundation, thanks to the anti-allergy filtration, making it a popular choice for customers with allergies and asthma. The SEBO X7 ePower boasts the latest suction technology and SEBO’s Computer Control System. The Computer Control System ensures the brush is always at the correct height, thereby optimising performance. In the event of a blockage, the computer system will shut the motor down, to prolong the life of your machine. The 31cm cleaning head runs flush to the floor, giving plenty of coverage – effectively cutting down on the time it takes to vac. The SEBO X7 ePower can also tackle a host of other cleaning jobs thanks to the additional tools, as standard. The patented integral hose features a telescopic tube that can reach into even the tightest corner to make light work of dust and debris. Crevice and upholstery nozzles add greater versatility and mean that you only need one machine to cope with stairs, carpets, car interiors and high-up cleaning. To find out more and to be in with a chance of winning just head to our Facebook, Twitter or Instagram pages to find out how you can enter our brilliant FREE competition. If you’re not lucky enough to win our competition you can buy a SEBO X7ePower vacuum cleaner and enjoy free delivery, rent for just £4.15 per week or use our Click & Collect service to pick one up from a local store in as little as one hour. Browse our SEBO range online or ask your local store about a demonstration.